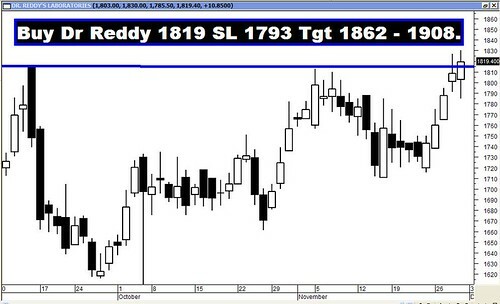 Archives : BULLISH BREAKOUT FINALLY - 30/11/2012. BULLISH BREAKOUT FINALLY – 30/11/2012. NIFTY HEADED TOWARDS 6148 - 6160. As suggested last week, the indices bounced back after taking support at the Bullish Rising Gap between Sensex 18284-18062 and Nifty 5526-5447. But the strong upward rise was a surprise as well as a welcome relief for the market as the Bulls broke the trading range of last two months. When the Nifty closed above the intermittent top of 5815 on Thursday, the market seems to have resumed the strong upward rally which was in place till September. Sensex is now headed towards minimum target zone of 20142-20238 and Nifty 6148-6160. Sensex opened the week at 18574, made a high of 19372, low of 18508 and closed the week at 19339. Thus it registered a strong weekly gain of 833 points. At the same time the Nifty opened the week at 5648, made a high of 5885, low of 5628 and closed the week at 5879. Thus the Nifty went up by 253 points on a weekly basis. Both the indices have registered a big white body candle on the weekly charts. The candle formation is very close to forming a big white body Marubuzo. On the daily charts both Sensex and Nifty have made a Three White Soldiers but in an uptrend, hence it is more of a Bullish Continuation pattern. Hence both daily and weekly charts are suggesting bullishness to continue in the next week. On the weekly charts, both Sensex and Nifty have completed a Flag formation and the target according to the pattern comes in at Sensex 21024 and Nifty 6415. The targets will be achieved as long as the Sensex remains above 18255 and Nifty 5548. If we take the Saucer formation which is due to the fall from Sensex 18523 to 15748 and Nifty 5629 to 4770, then the target comes in at Sensex 21298 and Nifty 6488. Hence we have a Target zone of 21024 - 21298 on the Sensex and 6415 - 6488 on the Nifty. Besides the above formation, indices have also formed a Bullish Diamond pattern and the target as per this formation is Sensex 20171 and Nifty 6192. Also market had tested the Falling Channel Top and bounced back from there. Hence the overall long term target for Falling Channel pattern breakout remains intact. The targets as per this formation are Sensex 20383 and Nifty 6148. Last week both the indices bounced back from Sensex 18255 and Nifty 5548 which is within the Bullish Rising Gap between Sensex 18062-18284 and Nifty 5447-5526. This gap has acted as a strong support for the market even before as the Sensex had bounced back from a low 18291 and Nifty 5534. This gap holds more significance because a breach of this gap will signal the end of the current rally. The indices have managed to reclaim and move above the short term average of 20dma (Sensex – 18672 and Nifty – 5679), and medium term average of 50dma (Sensex – 18681 and Nifty – 5677). Also both the indices are well above the long term average of 200dma (Sensex – 17579 and Nifty – 5335). Thus the trend in the short term and medium term timeframes has turned bullish once again, whereas the trend in the long term timeframe continues to be bullish. MACD and ROC are both positive and in Buy mode. RSI has moved higher and has just entered overbought zone at 71. Stochastic Oscillator is also in overbought zone as %K is at 92. But %K is above %D and hence continues in Buy mode. 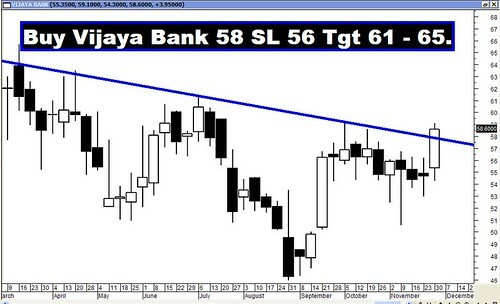 MFI has given a fresh Buy signal as it has crossed the equilibrium line and is at 57. ADX has moved higher to 23 indicating that the trend is now gathering strength. The Directional Indicators i.e. +DI and –DI continue in Buy mode. OBV too has started moving higher and is just below the previous top. Oscillator analysis suggests that despite the uptrend being so strong, minor dips can be expected as certain oscillators are overbought; but those dips should be used as a buying opportunity. The Nifty O.I. PCR has improved to 1.37. Highest Open interest build up for the December series is at 6000 Call and 5700 Put. This suggests that the market expects a trading range for the Nifty with support coming in at 5700 and resistance around 6000 levels. On Friday, Nifty 5800 strike has seen high Put writing and hence one can expect a strong support at Nifty 5800 in the near term. Trendline Support for the Sensex is at 18852. Trendline Support for the Nifty falls at 5749. For the week ahead, Sensex will find Support at 18973-18616-18255 and will find Resistance at 19697-20022-20323. For the week ahead, Nifty will find Support at 5777-5660-5548 and will find Resistance at 5971-6084-6181. It was a great week as all the recommendations performed exceedingly well, except for Zee TV. However the star performers of the week were Reliance Communication and McLeod Russel which went up by more than 14% and 10% respectively!! !